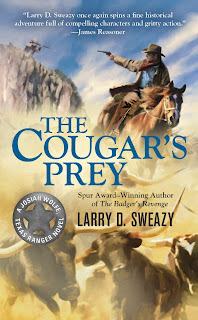 Larry D. Sweazy's fourth book (Berkley Western Novel, $6.99) in his award winning Western series thrusts Josiah Wolfe into yet another cauldron of intrigues where friends and foes are interchangeable and the fate of the Texas Rangers seems to hang on the ­threads of his personal actions. In his third year of service, Ranger Wolfe is caught in events swirling around the financial crisis of 1873 and the lingering aftermath of the War Between the States [Civil War to northerners]. He's also at the cusp of facing up to his own need to provide a stable home for his young son and balancing new love against haunting memories of his deceased wife and daughters. Josiah Wolfe is a flawed hero, which is what ­makes us embrace him all the more fiercely. He's anyone of us across time and place trying to do the right thing against odds. And that's Sweazy's gift as a storyteller - Texas circa 1870s is immediate, with officials entrusted to serve the greater good actually acting in their self-interest and motivated by personal greed. Josiah is basically a simple, decent person most often out of his element in a world of intrigue. How he balances his integrity against political machinations set to destroy the fabric of a good life for the "little people" is the stuff of Sweazy's page turner series. The Cougar's Prey is a worthy compan­ion to The Rattlesnake Season, The Scorpion Trail and The Badger's Revenge. - RITA KOHN.